In an effort to minimize the books I suffer through, I’ve started tracking my ratings by both publisher and imprint in a giant spreadsheet. Basically, if a certain publisher or imprint always results in bad ratings for me, I will know to just say no, at least to review copies, where I’ll have to send an awkward email to a publicist. In just a year, I don’t have a ton of data for some of the pubs, so I’ll just be including those where I’ve read a reliable sample, which I’m going to call 5 books or more. Even then, a couple of these averages are, I think, misleading, but most of them are about right. 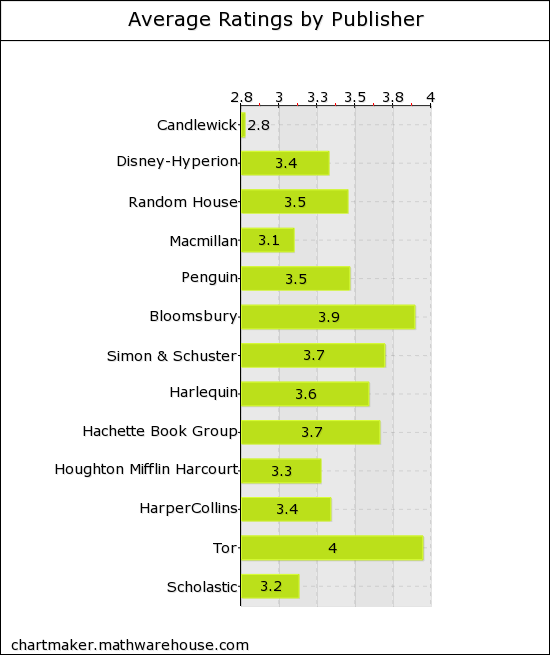 So first, here are my average ratings by publisher. Then I’ll break it down further for those with imprints. As you can see on this somewhat ridiculous bar graph, the averages range from 2.8 to 4 in the publishers I’ve read enough books from to include. Candlewick’s, though, is one that is a bit skewed, because 4 of the 6 books I read by them this year were part of a terrible series. I’d requested book four from NetGalley, so I felt like I HAD to read them all. Because of this basic data, I’ve been seeking out more books from Tor and Bloomsbury, as they obviously get me. Over the course of the year, I read 49 books from 14 different RH imprints, but in only three of them did I read more than 2 books. Note how much higher two of these are than the average of 3.5 for Random House as a whole. I don’t know that I’ve learned anything definitive yet, but Delacorte seems to be the most likely imprint for me with regards to RH teen books. I only recently started working with Macmillan, so I haven’t read nearly as many of their books. I read 22 books published by Macmillan from a total of 6 imprints. Penguin’s the publisher I’ve had the longest relationship with, but, ironically, this means that they also have much lower ratings than they otherwise might have, because it took me a long time to realize that I didn’t have to accept every book to for publicists to be willing to work with me. I read 49 Penguin books over 14 imprints, which is, very oddly, the exact same as for Random House. Overall, I’ve had a pretty good experience with Penguin’s young adult offerings, but they don’t work with me much, so my most read imprints, with the exception of Razorbill, are all from the adult group. In the next year, I’m going to be much more cautious accepting books from the Penguin Books imprint, since I generally like those less well than the other adult imprints. Oh, Bloomsbury, don’t you guys want me to review your books for you? No? Well, that’s okay. We’re still friends. I read 22 Bloomsbury books broken across 3 imprints. Lesson: read ALL of the Bloomsbury children’s books. Well, not all, but pretty much any that look good, because out of those 21, I only had one 2 and one 2.5. For me, that’s insane! S&S didn’t like me much on NG, and I only recently met any of their publicists, so there’s a serious lack of data here. I read 14 Simon & Schuster books in 2012, across 7 imprints. Since I mostly read review copies, I just haven’t read many of these. I wouldn’t include the break down here at all, except that I find the data interesting. The reason I find this so interesting is that at one point on Goodreads, I observed a conversation about how some folks thought Simon & Schuster was publishing some of the worst YA books out there, and I thought it was funny how high my averages are for S&S. Now, maybe they do publish some terrible stuff, but they also publish some amazing things, obviously. Simon Pulse, especially seems awesome, but I haven’t read enough for this to be definitive. Touchstone is the imprint I’ve gotten some review copies from, but, obviously, there books haven’t stood out for me yet. Hachette used to be very good to me on NetGalley, but, actually, I think most of these are books I bought, borrowed from the library, or got from Orbit. I read 20 books, spread across 7 imprints. Fun fact: Orbit is the one and only example of me sending a request for a review copy and that leading to a relationship with a publicist. All the others found me when they deemed me worthy, one way or another. In case you’re curious, I requested Mira Grant’s Blackout. They were kind enough to also send me Deadline. Plus, my average rating is close to a 4. Is it any surprise that I love Orbit? HMH’s averages for me definitely suffer from what I like to term NG syndrome. I would request anything that looked remotely interesting on NG, and, for a while there, I read ALL of the books I requested, thinking DNFing was rude. Thus, I ended up forcing myself through a lot of books I otherwise wouldn’t have read. Now that I don’t really use NG, I have zero relationship with HMH, and I’ll probably read like 3 of their books this year. Honestly, though I’m not sure how representative this data would be of my reading had NetGalley not been part of the equation, I’m not feeling a burning desire for HMH books. Well, except for Gina Damico’s Croak series, which is published under the Graphia imprint; those books rock and everyone should love them. Harper I’ve actually not really had much of a relationship with, but I won a couple of their giveaways on FB when they did that, and they have the prettiest covers, which lured me into buying/borrowing more of their books. Oh, also, their adult group makes good use of TLC Book Tours, which I love. Thus, I read 46 Harper books over 10 imprints. Harper’s one of the publishers where I feel like imprint can be most telling. I feel like I definitely need to watch out for HarperTeen books in particular. While I do really, really like some (Something Strange and Deadly, I’m looking at you), they tend to fall flat for me really reliably; I have two 1.5s and a 2 for HarperTeen books. Katherine Tegen’s average is from a 2, a 3, and a 4, so I really don’t think that’s enough to make a judgment. I believe the HarperCollins imprint is where they publish their premier titles, like Lauren Oliver, so I’m not surprised it’s the highest average. Pretty much all Harper books are hit or miss for me, though. While Tor is not a big publisher, they attract my attention often, because they publish the sort of books I love, namely fantasy. Over 2012, I read 10 Tor books across three imprints. Basically, I love fantasy. I mean, look at those ratings. Fantasy is my home genre, the one I’ve been reading the longest. Tor publishes primarily fantasy and science fiction, and I eat that stuff up. I hope to have more Tor in 2013. I’m sharing this just for fun, though I don’t know if it will be interesting for anyone but me. A year’s data isn’t necessarily enough to make any big decisions off of, but I will continue to track this as time goes on, which will hopefully help guide me to books I love and save me from falling for pretty covers. I thought this post was great! I never thought to track publisher ratings. It would probably help save me a lot of hard reading. Glad you liked it! I feel a bit ridiculous doing it, but I hope it helps me in the long run! I definitely pay attention to imprints, Christina. Some of them tend to be consistent winners for me, too, although I use it more as a “makes my ears perk up” than an avoidance strategy. I’ve been surprised by the depth of some of the titles published this year by some houses that also publish some of my least favorite titles, so…you just never know. Fun to look at stats, though! Girl, you are organized! And also, judging by all the books on your charts here, very busy! I’m pretty sure I’ve got somewhat similar ratings for the publishers I prefer. Tor seems to get most of my high ratings, followed by Orbit, Simon & Schuster and HarperCollins. Bloomsbury is a hit and miss, so as Penguin, and St. Martins mostly miss for me. I can’t find many of their releases that suit me. I love your ratings, Christina! Really interesting, they always make me think and compare. I think this is great! And helpful, something I wish I would have done for 2012. Wow, this is awesome! It’s got me super tempted to try something similar – but I can only imagine how long it might take. I don’t know that I’ve ever really paid attention to publishers/imprints…maybe I should! This is a great idea; it’s something I was planning on doing this year and after your interesting results, I’m definitely following through. Have you read anything by the new publisher Strange Chemistry? I’ve read two so far and fell in love with the both of them: Pantomime and The Assassin’s Curse. huh I had never thought of tracking something like this by publisher, I wonder what my stats would look like. It’s a neat idea for sure! That’s an amazing idea! I should do this too. Did you manually make up a spreadsheet or can you export data from goodreads? This is a very interesting idea! I haven’t noticed any publishers I always tend to enjoy, but I do know of one that I’ve given only 1 stars to for all of their books. It’s daunting when you have to go back and do it, but if you update every week or two, it’s not too bad.